I am pretty much obsessed with this recipe, you guys. It is so tasty that just looking at these pictures has my stomach rumbling! Pasta salad is one of those dishes that’s on the menu of almost every summer picnic or barbecue. I love it, but let’s be honest, it’s not exactly healthy stuff. Since I’m trying to drop a few pounds this summer, I’m also cooking healthier meals. I already love kale salads, so I thought why not add a little pasta to change things up a bit. 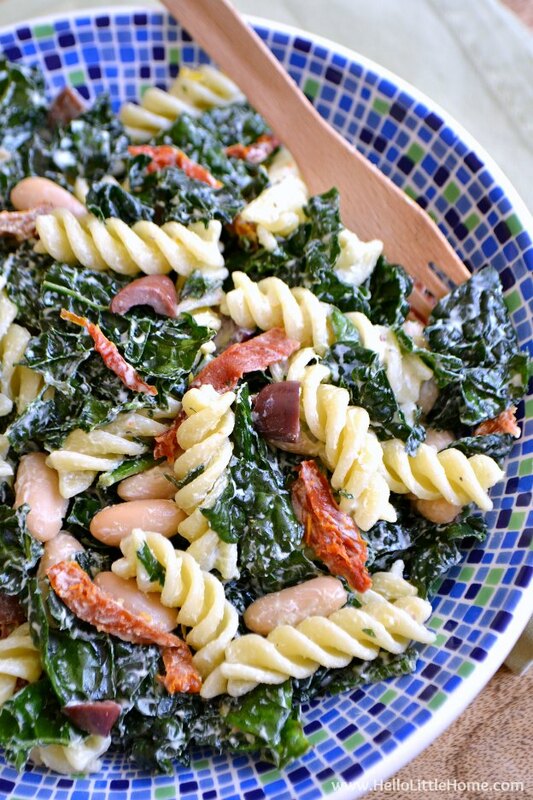 This Kale Pasta Salad with Creamy Lemon Basil Dressing is the super delish result! Eating pasta sometimes feels a little naughty when I’m trying to lose weight, but not with this Kale Pasta Salad. It’s positively overflowing with fresh greens, and I can eat a huge bowlful without any guilt. But the most important thing is that it tastes so good! The trick to making a good kale salad is softening up the greens. It sounds silly, but after drizzling the kale with olive oil and salt, you need to massage it in. Get right in there with your hands and work the oil and salt into the kale! 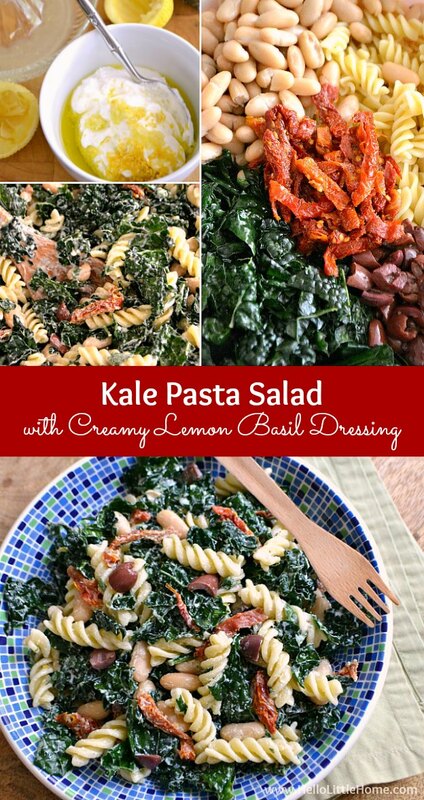 If you skip this step, your Kale Pasta Salad with Creamy Lemon Basil Dressing with be tough and unappetizing. That’s really the only trick to making this easy Kale Pasta Salad, otherwise it’s so simple to make. 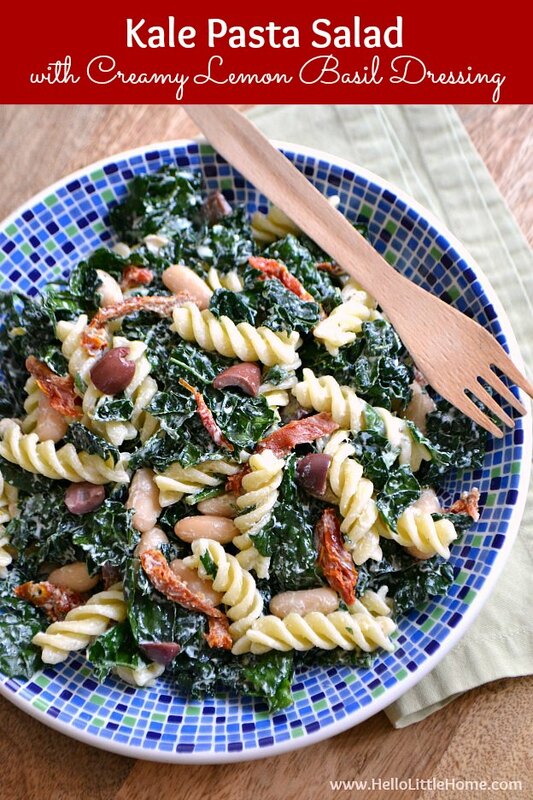 Once the kale is ready, toss it with rotini or fusilli pasta, sundried tomatoes, olives, and white beans. I used regular pasta because it’s what I had on hand, but you could use whole wheat or even gluten free pasta to make this dish even healthier. Then you’ll add the Creamy Lemon Basil Dressing. If you never make your own salad dressings, don’t worry. It’s going to take you minutes to make, and it tastes amazing … creamy and delicious, yet still good for you. Are you serving a vegan? Use dairy free yogurt and this salad is totally vegan friendly. This Kale Pasta Salad with Creamy Lemon Basil Dressing would be the highlight of any summer party or barbecue, or enjoy it all year long. I know I will be! 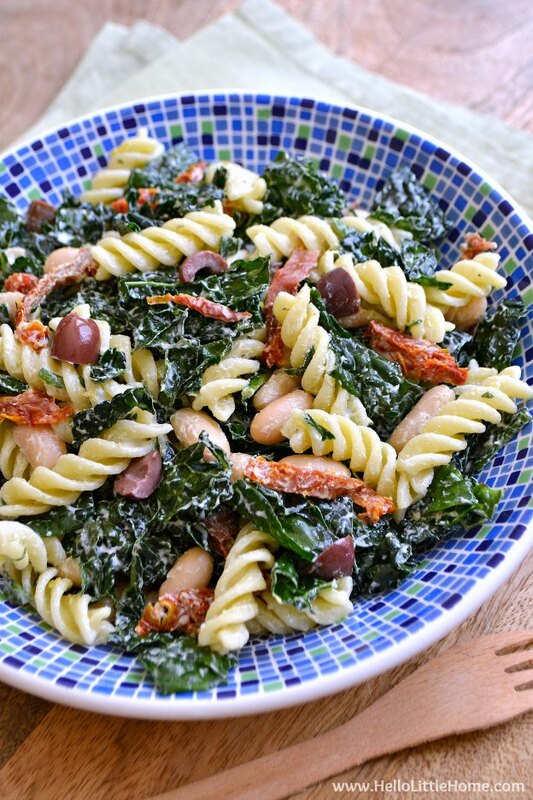 This Kale Pasta Salad is a delicious recipe that healthy and hearty! Add pasta to water and cook until al dente. Drain pasta, then rinse with cool water. Set aside to drain well. Place kale in a large bowl. Drizzle with 1 tablespoon olive oil and sprinkle with salt. Massage olive oil and salt into kale with your hands for about 2 minutes, or until kale is well coated and slightly softened. Set aside. While pasta is cooking, zest the lemon, then mince the zest. Juice the lemon, as well. Whisk the zest and juice together with the remaining dressing ingredients (yogurt through garlic) until well combined. 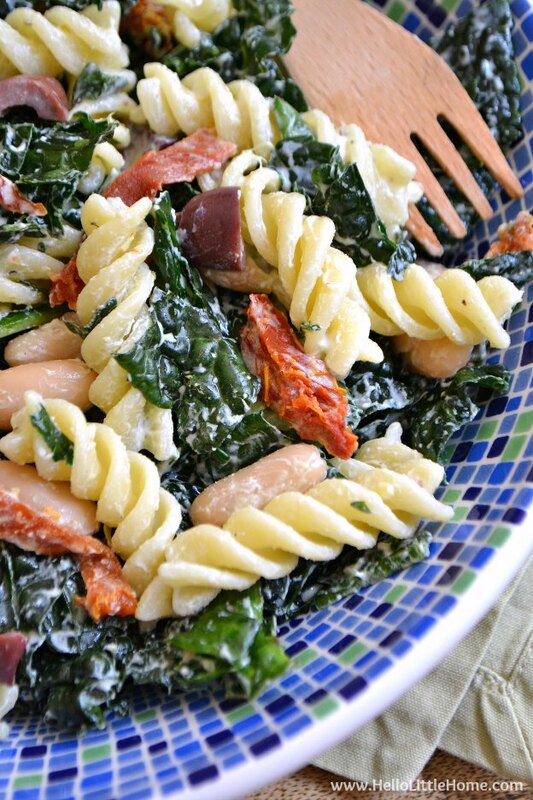 Mix pasta, beans, tomatoes, and olives into kale. Add dressing to kale mixture and toss until well combined. Serve salad immediately or refrigerate until ready to eat. Enjoy! Loved this Kale Pasta Salad? 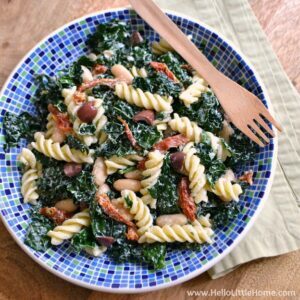 If you enjoyed this recipe, make sure to try my Italian Pasta Salad … and you’ll love these other kale salads, too! Massaged Kale Salad with Lemon Dressing … this basic recipe has tons of tips for making kale salad! I’ve already pinned this, Ginnie! I like the idea of adding some pasta as a little treat!